When developing constitutive models, it is crucial to run the model under a variety of standard (and some nonstandard) homogeneous deformations. To do this, you must first describe the motion mathematically. As indicated in http://csm.mech.utah.edu/content/wp-content/uploads/2011/03/GoBagDeformation.pdf, a good way to do that is to give the deformation gradient tensor, F. The component matrix [F] contains the deformed edge vectors of an initially unit cube, making this a very easy to way to prescribe deformations. This list specifies a set of deformation gradients sought at specific times, and the animation connects them piecewise linearly in time. 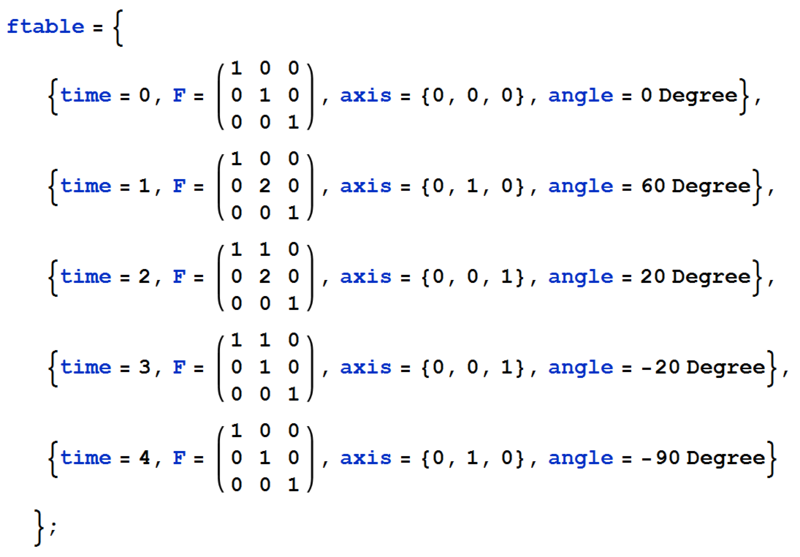 The list also includes incremental rotations (specified by rotation axis and angle) to be superimposed on the given F-tensors as the motion proceeds, which is very useful for testing frame indifference of constitutive models. The motion in this table is shown in the animations first without superimposed rotation, and then with superimposed rotation. 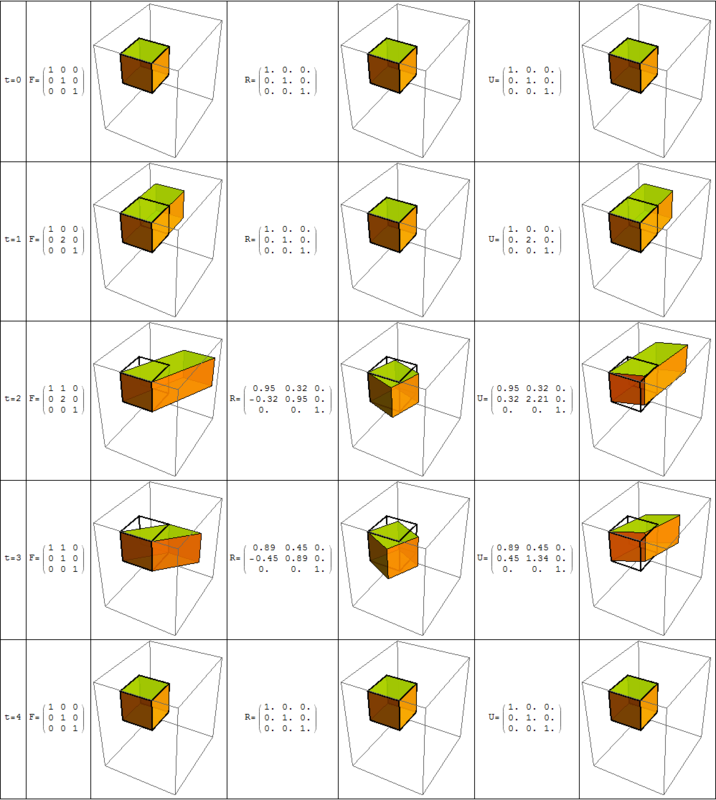 Each column of an [F] matrix is the deformed edge vector of the cube. Thus, with these vectors in hand, you have enough information to determine the position, displacement, and velocity of each corner of the cube (which could, in turn, be used to set nodal boundary conditions in an FEM simulation of this single-element deformation). In this example, the nodal data for the motion without superimposed rotation are listed below. Have some fun using F tables to make cool plots of weird deformations! Send those deformations to your newly developed constitutive model to rigorously check its performance with and without superimposed rotation! In our research group, we have modified our large momentum (and multi-physics) code to output a complete F-table history of any material point of interest. If the material point seems to be predicting bad results, this capability is very useful because we can reproduce the loading path in a single-element test, which helps us to fix constitutive model bugs in a fraction of the time. Extracting F-table histories of tracer particles is useful for more than just debugging. We have, for example, demonstrated that the loading paths experienced by the material in a penetration simulation are rarely even marginally close to the loading paths used to set the material parameters. This demonstrates that the data provided by experimentalists is of only marginal value since the constitutive modeler is forced to “theorize” about the material response in the actual loading conditions. Given that controlled experiments might not be practical for realistic loading paths, the ability to extract F-table histories helps to set loading paths for mesoscale modeling! This entry was posted in Intermediate write-ups, Software, Tutorials and tagged continuum mechanics, deformation, F-table, frame indifference, kinematics, single-element testing, superimposed rotation, verification. Bookmark the permalink.